We have been involved with over 20 Audi projects around the UK. Each project brings new challenges. We listen, learn and lead, evolving the user experience and maximising the potential of each. 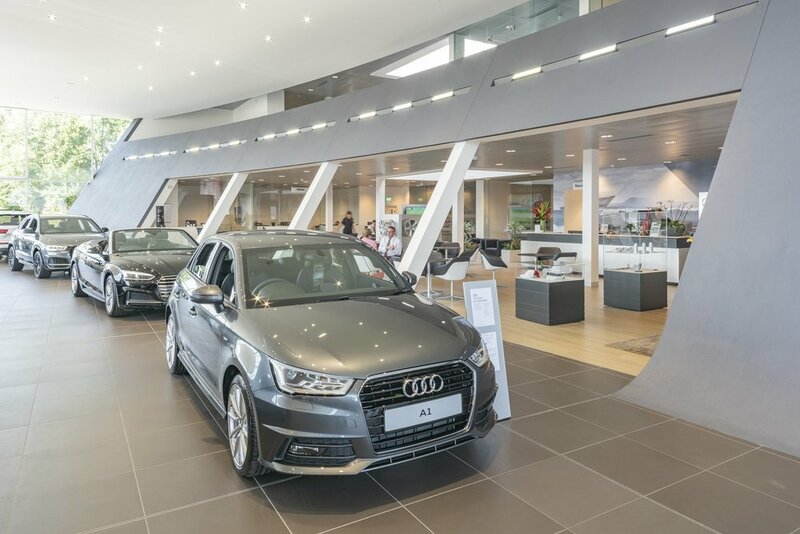 From sales to aftersales, car display to customer and staff areas SRA Architects tirelessly refine the concept of a successful Audi dealership. At Coulsdon Audi in South London, we were able to achieve what no other dealership had: considerate passive design reduces the energy load of the building, while 15% of energy consumed is generated from on-site renewable sources. From the Iowest-flushing WCs to A-rated building materials, sustainable drainage and rainwater harvesting, everything is designed to minimise the building’s environmental impact. We have been involved with a number of Audi terminal schemes – the ultimate application of their brand. Projects include Epsom Audi, where a scheme has been developed to locate a terminal design in a challenging context. It utilises roof top storage parking over the showroom in order to create as much space on the ground as possible for customers to enjoy. Other projects include Hereford Audi, where we have devised a scheme to redevelop an existing building to transform its appearance in to a terminal design.